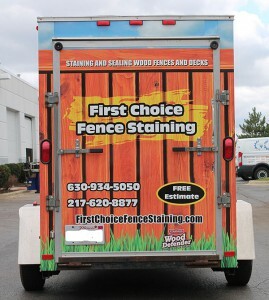 For superior quality vehicle and trailer graphics in Chicago, Contact Us or call (630) 289-7082. 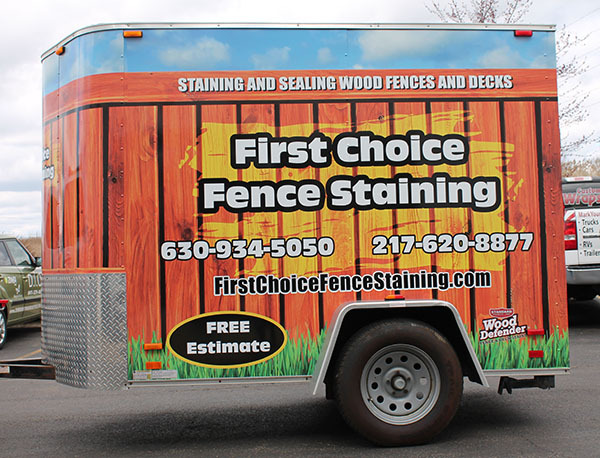 When you set up your trailer graphics wraps, make sure to keep the design simple. Remember, your trailer is rolling around in traffic, so you can’t overload viewers with a lot of text. Company name, phone number, and website are essential. Then a few short words about service, and that’s it. Keeping it simple doesn’t mean boring. You still want to be eye-catching. For First Choice, we went with an outdoor motif that gets attention and sends a message. 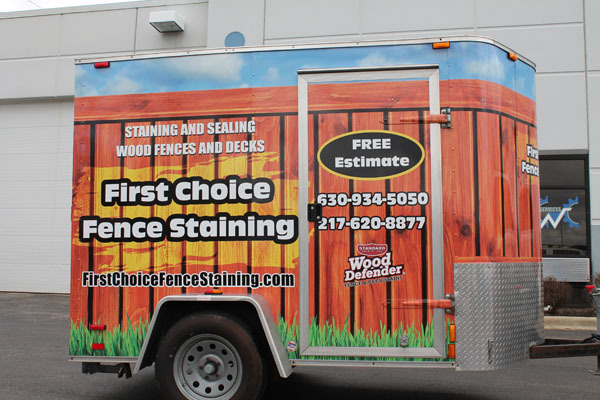 We tell viewers that their fence will look great thanks to the professionals at First Choice. We use the term viewers, since that’s what they are: people who will be viewing your trailer wrap add while sitting in traffic. The number of impressions can be tens of thousands. Having a clear, simple, and attractive design helps stick your brand name in their minds. 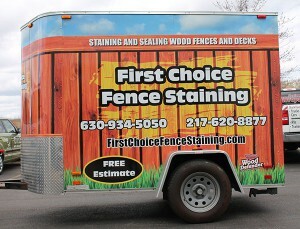 Later, when they need your product or service, the image of your trailer immediately comes to mind. Subliminal messages are commonplace in advertising. For example, big brands pay big bucks to have their logo placed in a movie scene. You can do the same thing with a trailer wrap, but instead you place your brand in a person’s life. 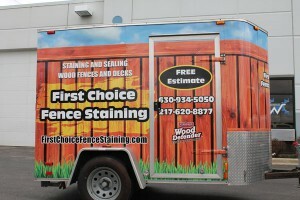 They could be commuting, shopping, doing yard work – whatever – but they will eventually see your brand name around town. Since you want to look good, make sure the quality of the wrap is top grade. If it fades, cracks, or peels then it hurts your brand image. We use 3M material which carries an incredible 8 year guarantee. Our printing process uses digital printing for excellent definition. Finally, we apply all wraps in an environmentally controlled area to prevent dust and dirt from getting under the wrap. The finished product has vibrant colors and an application free of unsightly bubbles and wrinkles. 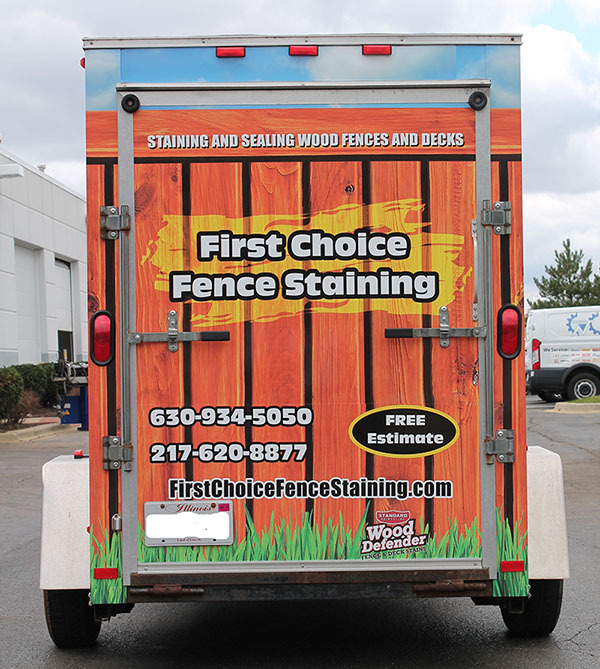 Move your brand forward with fleet and trailer graphics in Chicago, Contact Us or call (630) 289-7082.